James Blackney was a son of John Henry Blackney and Annie Lyfield. The family lived in Cox Street Hamilton and later, Ballarat Road. 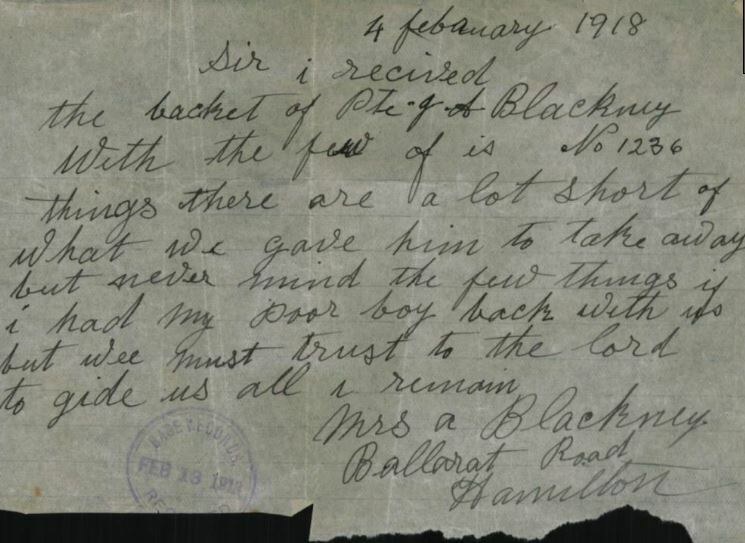 John Blackney, a labourer and long-time Hamilton resident, died in 1910 at Ararat. At the age of twenty-one, James, a blacksmith, enlisted on 20 March 1916 and went to the 39th Battalion camp at the Ballarat Showgrounds. He left Australia in May and arrived at Devonport, England on 18 July 1916 and proceeded to Lark Hill camp in Wiltshire. James left for France on 25 November 1916 and by early December was at Houplines, a member of the 13th Platoon, D Company, 39th Battalion where they remained until February 1917. 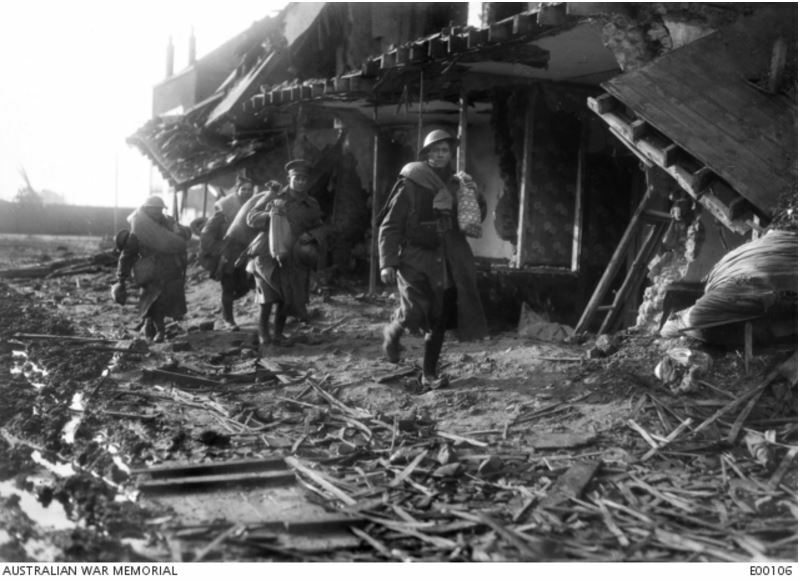 By the end of April 1917, the 39th Battalion was at Ploegsteert. On 25 May 1917, James was in a working party in a frontline trench near Ploegsteert Wood fixing emplacements of trench mortars when a shell hit about 11:00 am, burying James. He was dug out but he was dead. One witness said a machine gun bullet was found through James’ heart. Whatever the cause of his death, James was killed instantly. 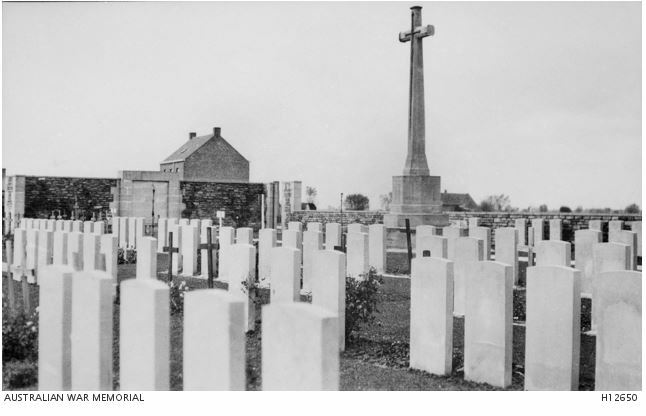 He was buried at the Strand Military Cemetery (below) near Ploegsteert. The effect of the war was felt by the extended Blackney family. James’ older brother John married Mary Crawford McClintock in 1913. Two of Mary’s brothers, James and John McClintock were killed in France, James on 24 August 1916 and John on 1 March 1917. Annie Blackney died aged Hamilton in 1937 aged eighty-three. James Blackney’s name is on the Hamilton War Memorial.